NETZSCH Pumps North America, LLC, experts in solutions designed specifically for difficult pumping applications, announces the new N.MacT Twin Shaft Grinder, designed to protect pumps and processes. The N.MacT is designed to fragment a variety of materials, and is ideal for wastewater treatment, biogas and biomass plants, food, animal processing, and other waste and industrial applications. Available in both channel and inline (flanged) housing construction, the N.MacT can be installed into effluent channels or upstream from a pump. Complementing existing NETZSCH product lines, the N.MacT expands grinding technology offerings, providing an upstream application to core NETZSCH pump technology. Featuring cartridge cutting knives for quick and simple replacement and servicing, the N.MacT offers quenched lubricated mechanical seals for dry running capability. The mechanical seal cartridge design – a leak free combination of mechanical seal and bearing cartridges – enables quick and simple replacement and servicing. For higher flow applications, grinders can operate in parallel, enabling partial servicing while in operation. The N.MacT can be mounted upstream before the pump (inline model) or on top of the auger (channel model). Grinders can also be stacked for successive particle size reduction. An optional control panel is equipped with an auto-reverse feature to retract jammed media. The N.MacT Twin Shaft Grinder features modular assemblies and interchangeable components that facilitate universal parts servicing. Dual recessed and self-collapsing lifting tabs make pull-out for servicing simple. The flanged versions include cleanout and inspection ports. Dual tempered hex shafts are designed for pre-indexed assembly and even transfer of load. An exclusive shock absorption system guarantees quiet and trouble-free prolonged operation. TIGG has been around for over 40 years so it is safe to say we are experts at what we do with Granular Activated Carbon, and we do a lot! TIGG provides a broad range of systems, equipment, and services for the removal of trace contaminants from air and water. Whether the equipment is used for environmental remediation, municipal applications or industrial process purification, customers appreciate our expertise in designing systems that solve problems. Atlas Copco Screw Blowers Save the Town of Hurlock, Maryland Big Energy! The activated sludge process was developed in the United Kingdom in the early 1900s and is currently utilized in medium- to large-scale wastewater treatment plants. The activated sludge process separates the flocculants (suspended solids) from the wastewater through sedimentation. Effluent enters the aeration tank or lane, and low pressure air is introduced through a grid of diffusers. Water usually passes through the process in a few hours, while the sludge retention rates vary from a few days in warmer climates, to a few weeks in colder weather. Although similar to the activated sludge process, lagoon aeration is typically used in rural areas with small- to large-sized plants. A series of shallow earthen basins (lagoons) act as the aeration basins and holding tanks. Although lagoons are often equipped with surface aerators, there are several diffuser systems available specifically for these applications. City of Hurlock Wastewater Plant Superintendent, Eric Barnhart, said the lagoon system was cost effective, but did not provide the desired quality of effluent they were looking for. The activated sludge treatment facility in Hurlock has won several awards. The plant was first named the Maryland Rural Water Association Wastewater Treatment Plant of the Year in 2008, before winning an award from the EPA in 2009 for operations and maintenance excellence. The problem, however, was that the new activated sludge plant used nearly 7 times as much energy as the old lagoon system (now averaging $18,000 per month in electricity). In an effort to reduce energy consumption in 2015, the plant turned to the largest energy consumer in their plant. Blowers, for aeration and mixing, typically account for 40 to 75 percent of the total energy consumption in a wastewater treatment plant. For the Town of Hurlock, the aeration blowers accounted for $7,000 per month of their total monthly $18,000 electrical cost. When the activated sludge plant was built, positive displacement lobe blowers (PD blowers) were installed to provide air to the aeration basins. Although only ten years old, the 75 HP lobe blowers were very inefficient. To understand why, one first needs to understand more about the technology. The lobe-style blower invented in the 1800s remains very much unchanged today. The primary advancement in lobe technology over the past 150 years has not been improved efficiency, but reduced noise. Bi-lobe blowers produce very high amplitude pulsations at a low frequency. In order to reduce the amplitude and increase the frequency of the pulsations, a third lobe was added. While this innovation decreased efficiency slightly, it reduced noise levels to below 85 dBA as mandated by OSHA. Figure 1 below shows the four stages of compression of a tri-lobe blower. While lobe blowers are reliable and work well in many applications, their inefficiency is a big drawback. One of the reasons PD blowers are inefficient is due to rotor slip. Slip occurs when hot (compressed) air moves back to the inlet of the blower past the small gap between the rotors, and the rotor and casing. This means the hot air must be compressed again before being discharged to the system, reducing capacity and efficiency. In general, slip increases as pressure increases. Another reason PD blowers are inefficient is due to external compression. As air passes through a PD blower, the actual compression of the air occurs at the discharge flange due to blowback of the receiver. A pressure versus volume graph (p-v diagram) of the lobe blower’s four stage compression cycle is shown below in figure 2. The laws of thermodynamics dictate that the area under the curve is proportional to the amount of power consumed. Therefore, by reducing the volume of air during the compression cycle, the area under the curve can be reduced (AKA: reduced power). This reduction is accomplished by a rotary screw blower. In an effort to increase the efficiency of positive displacement blower technology, the rotary screw blower was introduced to the market in 2009. The rotary screw blower uses a helical screw profile, instead of lobes, to create internal compression of the inlet air. The screw rotor profile serves three purposes. First, the internal compression of air reduces energy consumption by 30 percent compared to traditional lobe blowers. Second, the helix of the rotor profile helps to reduce slip by creating a tighter gap between each of the rotors and the blower casing. Third, the helical rotor profile also eliminates the pulses caused by a lobe-style rotor. This means that screw blower noise levels are typically below 75 dBA, which is three to five times quieter than conventional tri-lobe blowers. Figure 3 illustrates the compression stages of a rotary screw blower. 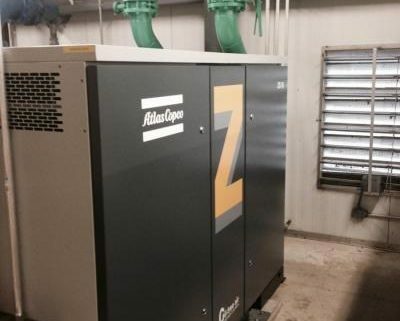 After learning the advantages of screw blower technology, the Town of Hurlock elected to replace two of their 75 HP lobe blowers with 75 HP Atlas Copco ZS rotary screw blowers. Both new ZS blowers were installed before the end of 2015, and have been running ever since. “We really like our Atlas Copco blowers,” says Barnhart, “We are able to get more air out of them and use less energy than we did with our old lobe blowers.” Figure 4, below, shows the old lobe blowers installed at the plant. Figure 4: Existing 10-year old lobe blowers installed at the wastewater treatment plant of Hurlock, Maryland. https://www.ketllc.com/wp-content/uploads/2018/10/Atlas-Copco.jpg 533 400 mike https://www.ketllc.com/wp-content/uploads/2018/07/kigipng.png mike2018-07-02 20:04:022018-10-02 20:08:17Atlas Copco Screw Blowers Save the Town of Hurlock, Maryland Big Energy!